SONOROUS IV | S'NEXT Co., Ltd.
With the synergistic effect of a hybrid design that merges balanced armature with a 50mm diameter dynamic driver unit coupled with BAM mechanism, we’ve achieved a clear, vast sound stage with depth to it. With these, the music that seemed to be localized inside our heads with existing headphones vibrates over a large space. 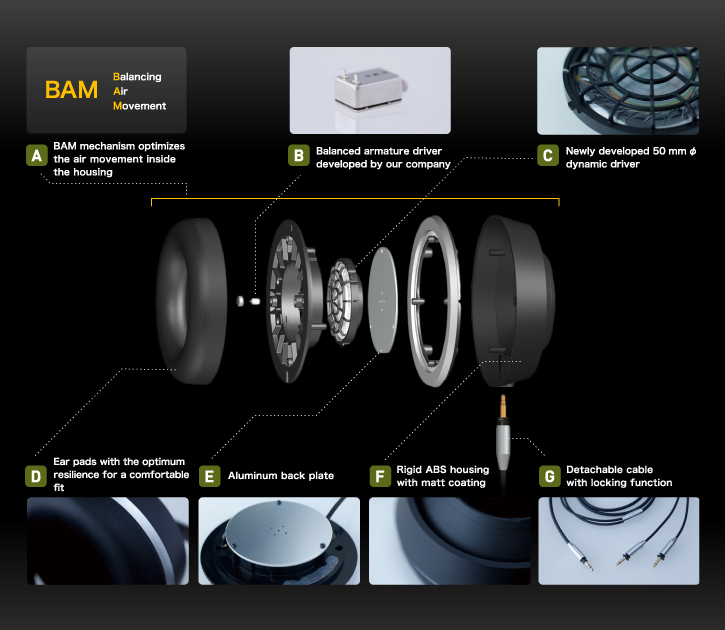 BAM mechanism optimizes the air movement inside the housing The BAM mechanism balances air pressure at the front and rear of the diaphragm, achieving three-dimensional sound with depth and low tones. Balanced armature driver unit developed by our company for optimal use as a tweeter. We’ve paid special attention to our choice of materials used in our pursuit of sound quality, utilizing a permalloy with a high level of magnetic permeability in the magnetic circuit. A driver unit with a diameter of 50mm, newly designed for SONOROUS. By increasing the precision of the parts, it has become possible to make the gap between the magnetic circuit, the pole piece and the yoke narrower than with common products. A powerful neodymium magnet is coupled with this, making for a high magnetic flux density. The result is clear sound quality. We’ve re-examined the shape of the tangential edge and have employed a lightweight diaphragm with a heightened responsiveness to micro-signals. The voice coil is copper-clad aluminum wire CCAW. Clear, crisp bass tones are achieved with the combination of a magnetic circuit with a high driving force and a light vibration system. So as not to inhibit the sound emanating from the driver unit, and so that there is no unnecessary added reverberation, a form that is as slim yet as strong as possible has been pursued. This contributes to clear sound quality. What plays an important part in sound quality is the fit between the user’s ear and the ear pad. If there is space between the two, then bass tones are lost; if the ear pad presses against the user’s ear with too much pressure, then apart from it being uncomfortable, the acoustic pressure of the bass tones rise too high, resulting in negative influences on sound quality. In spite of this, there was no evolution seen in the ear pads on the market, and they continued to be made using the same structure for many years. We got engineers who had been involved in the development of corsets to participate in developing our ear pads, and re-examined the fit between the user’s ear and the ear pad. By employing the appropriate technology – pursuing synthetic leather with the best elasticity and the best sponge cutting and adopting ultrasound fusion for the adhesion of the synthetic leather to the inner frame – we constructed an unwrinkled, three-dimensional form with just the right amount of tension to it. A 1.5mm thick aluminum back plate at the back of the driver unit for achieving air pressure balance. Not only air pressure balance but also great results in the suppression of unnecessary vibrations are manifested. To achieve a high level of precision with the hard matt-finished ABS housing used with high-grade camera lenses, we conducted a substantial number of simulations, right up to the fluidity of the molding material used. We employed a gold-plated monaural plug with a 3.5mm diameter for the connector on the headphones. By employing a connector with a long-standing performance record, we avoided any trouble resulting from poor contact owing to deterioration due to aging. The cable has a locking mechanism that rotates 90 degrees.